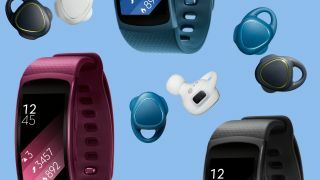 While it may not have been the world's best kept secret, Samsung's latest batch of rumored fitness tech is now official. The Samsung Gear Fit 2 is the successor to the Gear Fit and it appears to be a worthy one. In addition to a bit of a design overhaul, this new wearable has a few neat tricks to put up your sleeve. First off, it's compatible with a broader range of Android phones instead of working only with Samsung-branded devices. If you're using KitKat or newer, you're all set. Next on the list is the built-in GPS function, a most useful fitness capability for a modern fitness tracker. All in all, this $179 (about £124, AU$247) wearable looks to be an improvement across the board. Global pricing and availability details are still being worked out, but you can read more of our early impressions with the Gear Fit 2 here. It's the Samsung Gear Icon X, the company's first all-wireless set of headphones. Not only has the cord been snipped between the buds and the smartphone, but between the two earphone units, too. The Gear Icon X fits snugly in the ear and powers up automatically by detecting your pulse through the built-in heart rate monitors. Similar to the Gear Fit 2, the Gear Icon X is made to be used with or without a phone. As such, you can load music onto them and listen even when your smartphone is at home. The Gear Icon X is launching for $199 (about £137, AU$275; global pricing and availability details to be announced) later this year, but these headphones already offer up a ton of promise.